Andy Cunningham (Mallaig) and Norman ‘Raasay’ Gillies (Kyleakin) have been key players for their sides this season. League newcomers Mallaig face reigning champions Kyleakin in Broadford on Saturday (22nd September) with the 2018 Skye and Lochalsh Football League Championship at stake. This season’s champions will be determined by virtue of a winner-takes-all, title-deciding playoff after both sides finished neck-a-neck on 39 points in the table – as goal difference isn’t factored in. Mallaig secured their place in tomorrow’s showdown after recording a fantastic 4-3 away victory against Sleat and Strath in the final game of the campaign in which their goalkeeper Mark Johnston pulled off a late penalty save to seal the victory. Kyleakin, meanwhile, took the spoils with a well-deserved 4-1 home win in their crunch match against fellow title contenders Portree Juniors thanks in part to a splendid showing by goalkeeper Craig Wilson. With the teams having scored 168 goals between them in the league this season – *including 14 in their three encounters so far, Saturday’s match-up promises to be a fitting finale to what has been a thrilling and unpredictable campaign. Ross Douglas (Mallaig) challenges Ivor Mackenzie (Gairloch/Aultbea United) during his side’s 8-2 victory over GA on Saturday 1st September. Photo credit: Willie Urquhart. Having gone from 2-1 up to 3-2 down, the Blues rallied with goals from substitute Brett MacMillan, who drew his side level and then from Andy Cunningham who struck a late winner to seal the points. Mallaig led twice, first through Marc MacLean, and then Angus MacNaughton but were pegged by Graham Campbell’s side. Just as it appeared a vital three points would slip through the net, Jamie MacGregor’ side struck a third in injury time as Ryan MacDonald set up Andy Cunningham for the winner. 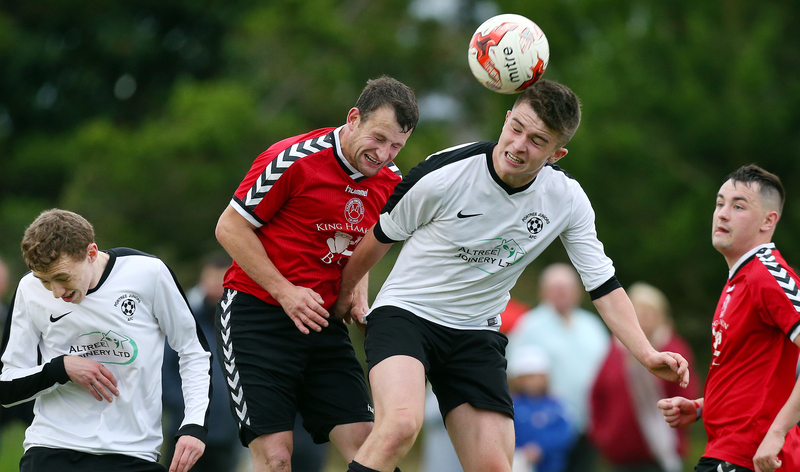 With only a win guaranteed to keep them in the hunt, Mallaig stepped up when the pressure was on to put in an excellent away performance against DL MacKinnon’s men. 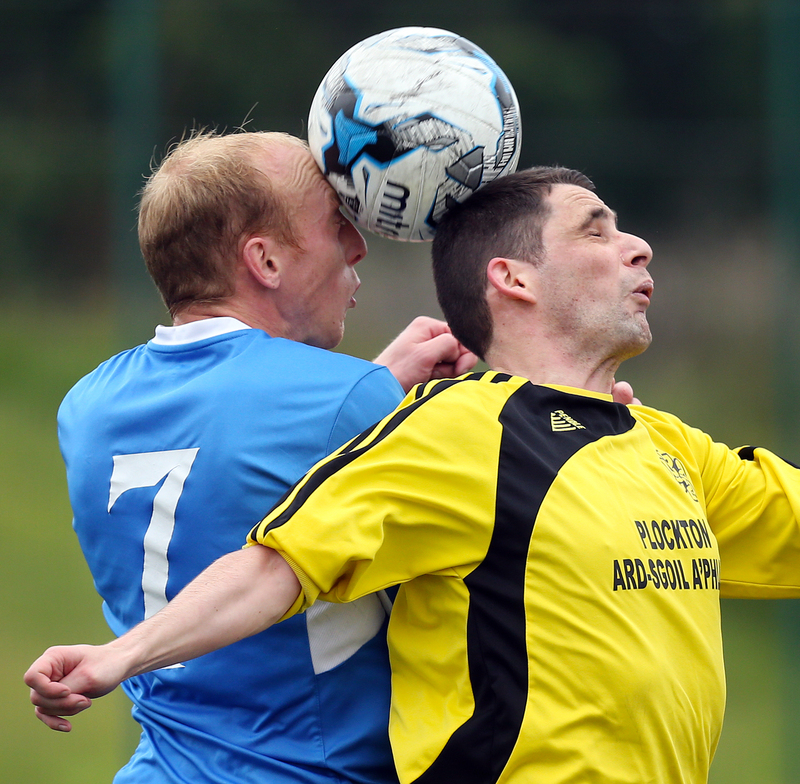 Ross Douglas scored a brace to help fire his side 4-2 ahead but Connaire Yoxon found the back of the net with a fine finish to halve their advantage. With less than ten minutes remaining Sleat were awarded a penalty and the chance to equalise. However, despite having been beaten from the spot earlier in the match, Mark Johnston dived to his left to thwart Ben Yoxon’s effort and with it seal his side’s playoff berth. Michael Taylor (Kyleakin) pressurises John Gillies (Portree Juniors) during the Reds vital 4-1 victory in the final match of the regular season. Photo credit: Willie Urquhart. After succumbing to a 3-0 defeat at the hands of their rivals the week before in the Ross Cup, Kyleakin came storming back with a confidence-boosting 2-0 win which brought them right back into contention, while also ending the hosts’ unbeaten run in the league in the process. Gordy Mccarroll opened the scoring with a well-taken effort from a freekick, with Cameron Thompson scoring the second from close range. In stark contrast to his display in the cup game the week before – which saw him earn a red card – Mccarroll put in a man of the match performance with a tireless showing and a goal to boot. 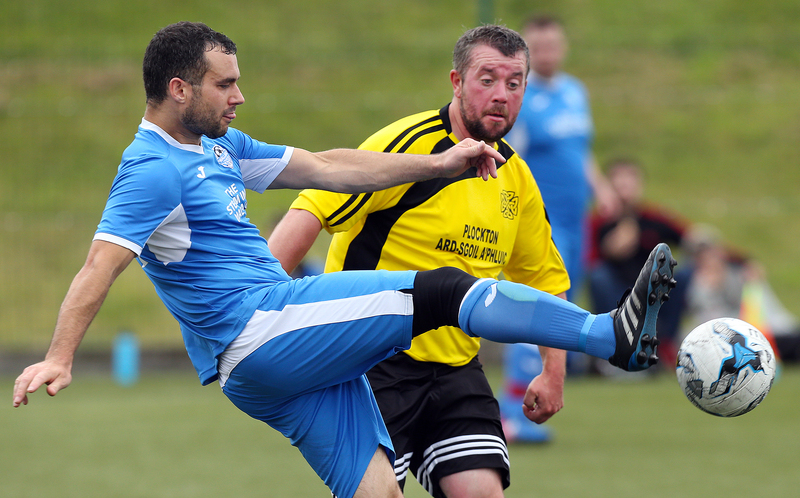 The south Skye side churned out an important win as they overcame a tough nut in Northwest. Kyleakin were far from their best in the first period but a Stewart Johnston goal before the break gave them a platform to build on. Clinical second-half strikes from Innis Thompson and Gordy Mccarroll sealed a victory which had looked far from certain for large periods of the game. With Mallaig having finished the season on 39 points, and Juniors holding a one-point advantage over the Reds going into the match, David Butcher’s side knew it was win or bust in terms of their title defence. What followed was a fine team performance by the 2017 winners with goals from Cameron Thompson, Stuart Gillies, and a brace from Gordy Mccarroll. Their victory was punctuated by some outstanding goalkeeping by Craig Wilson – including an incredible stop to deny Juniors as they threatened to turn the tide early in the second half. Neil Cameron of Mallaig (left) has hit a played an important part in his side’s run-in to the playoff. Photo credit: Willie Urquhart. What are your thoughts on how your team has performed this season? Did the excitement of the four-way title battle give you extra motivation? Gordy Mccarroll (second left) is congratulated by teammates David Falconer (left), Stuart Gilles (No. 7), and manager David Butcher (centre) after scoring in his side’s final day victory over Juniors. Jamie, has the impact your team has made in its debut campaign taken you by surprise? David, how does trying to defend the title compare to chasing it as such? “We really need to work out a game plan to unlock the Kyleakin code, they are the only team we haven’t managed to beat this year.” – Jamie MacGregor. How are you approaching what is a unique occasion in that it’s a playoff? 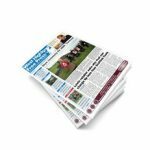 To keep up to date with what promises to be an enthralling end to the 2018 Skye and Lochalsh Football League season, like and follow the West Highland Free Press Facebook page by clicking here. 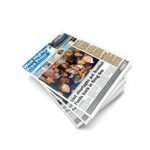 (*The 3-0 walkover awarded to Mallaig over Kyleakin in the GF MacRae Cup semi-final tie on Saturday 15th is not included in the above stat of the matches between the teams this season which are referenced. 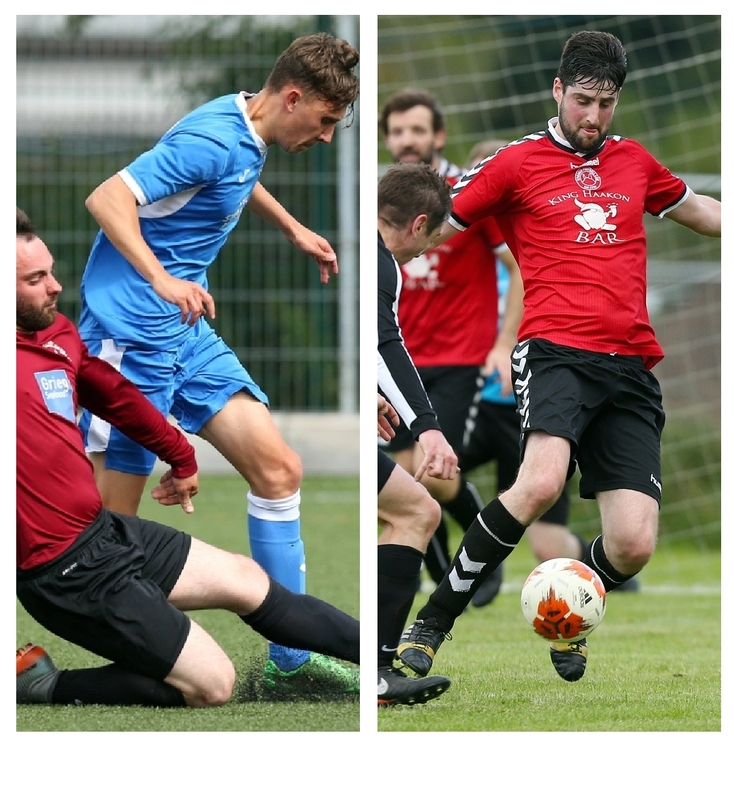 The results from those matches are as follows: Mallaig 2-4 Kyleakin – league – 26th May; Mallaig 1-4 Kyleakin – GF MacRae Cup Final – 9th June, and Kyleakin 2-1 Mallaig – league – 4th August. All images by Willie Urquhart.